Making my way inside the 2300 Arena in South Philly for the Jaron "Boots" Ennis-Raymond Serrano card, I stop off at the box office (Hard Hitting Promotions was presenting the show). I ask the woman behind the glass how ticket sales are going. She replies: "We're sold out. Every single seat. You wouldn't believe how many people we had to turn away. It's crazy." Earlier this year, Philadelphia hosted a strong Top Rank card headlined by the junior featherweight title match between Jessie Magdaleno and Isaac Dogboe. Also on the card were Philadelphia boxers Jesse Hart and Bryant Jennings in separate fights. In a strange scene, after the Hart fight, but before the main event, a large percentage of the crowd started to leave. One out-of-town media member incredulously exclaimed, "I thought Philly was a fight town." To which an elderly writer at the same table said, "No, Philly is a club fight town." Friday's Ennis-Serrano fight was affirmative proof of that statement. Electricity was in the air. The crowd was juiced. Yes, local fans show up for Philly vs. Philly fights, but Friday wasn't necessarily an example of that. Ennis had probably 90% of the crowd support. Through 21 fights in his career, Ennis had been a virtual wrecking ball, knocking out 19 opponents, and only six of them had even made it to the fourth round. But Ennis wasn't fighting in a vacuum, appearing deep on big fight undercards or in far-flung casinos. Counting Friday, 12 of his 22 fights had been in the greater Philadelphia area. In short, he's been building his career the old-fashioned way: fighting often (22 fights in just over 30 months) and close to home. He's been beefing up his local following one knockout at a time. Philadelphia is of course a proud boxing town and while the city may have slipped from its spot in the boxing pantheon over the last few generations, it's not as if it has been bereft of fighting talent. Over the last 10 years, the city has had champions such as Bernard Hopkins, Steve Cunningham, Danny Garcia, Jason Sosa (from across the Delaware River in Camden, N.J.) and Tevin Farmer. 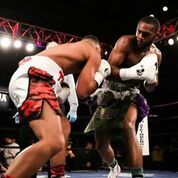 It also has produced title challengers such as Eddie Chambers, Teon Kennedy, LaJuan Simon, Demetrius Hopkins, Yusaf Mack, Mike Jones, Gabe Rosado, Eric Hunter, Hank Lundy, Julian Williams, Jennings and Hart. As much as Philadelphia loves a good club fight, the boxing community has often been slow to embrace its top local fighters on a more permanent basis. More than a few of those listed above never were able to build a substantial local or national following. As a result, they often plied their trades as "opponents" or itinerant sparring partners, keeping themselves close to a phone as they waited for a title shot. Interestingly, some of the most successful recent Philadelphia fighters developed their local followings after they had made it big. Bernard Hopkins and Danny Garcia weren't the toast of the Philadelphia boxing scene before they made it big. With Boots Ennis, things certainly feel differently. Everyone sees the talent. In talking to a few of the veteran boxing people around the area – the types that preach caution and perspective – even they acknowledge his abundant skills, fighting family pedigree (two of his brothers boxed, his father is a trainer) and his aggressive temperament. And of course, it doesn't hurt to be the main event fighter on a ShoBox card. Nationally, sharp boxing observers have started to confirm what the Philadelphia boxing community has seen locally. Thus, as Boots Ennis made his way to the ring on Friday, resplendent in his purple boxing attire, the crowd was deafening with its support. With his first punch of significance in the fight, Boots landed a jarring straight right hand out of the orthodox stance and then proceeded to paste Serrano around the ring as a southpaw. Throughout the first round, Ennis cracked Serrano with straight lefts, right hooks to the body and menacing combinations. By the end of the round, Serrano was holding on for dear life. But Boots was just getting started. In the second round, Ennis closed the show with an impressive display of versatility and firepower. He dropped Serrano for the first time with a pulverizing right hook out of the southpaw stance. Then, seconds later, he knocked down Serrano with a jab/straight right hand combo out of the orthodox stance. He finished off the fight with a flurry of punches while Serrano was trapped along the ropes, ending things with another right hook out of the southpaw stance. In short, it was a flawless performance and left the crowd in a frenzy. It's still early days for Ennis. At just 21 and in perhaps boxing's most competitive division, welterweight, there are no guarantees. He will have to avoid many of the pratfalls and hang-ups that have felled many top prospects in the sport. However, the talent is real. Perhaps most importantly, his destructive temperament in the ring separates him from other top American prospects. He's not one of these fighters who plays around with lesser opponents and amuses himself with his superior hand speed and athleticism. He's there to take guys out. Who knows just how far the Boots Ennis train may go? But it should make for an entertaining ride as he graduates from prospect to contender. So far, he checks off all the boxes. He's connecting with fans and those within the boxing industry. He may be Philadelphia's next big boxing star, but I have a hunch that he wants far more than that.